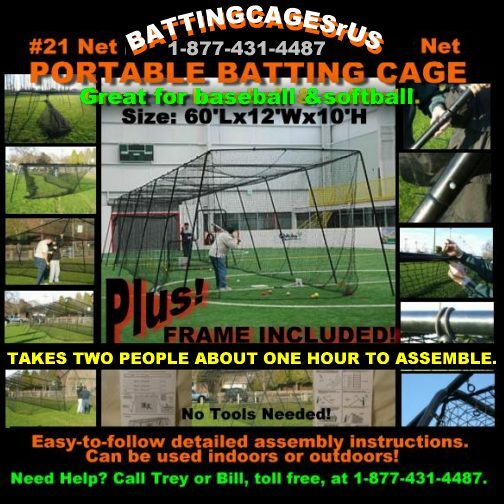 BattingCagesrUs.com supplies customers with top quality batting cage nets and fast friendly service. We sell "net and frame" packages, nets of all sizes, and screens of all types for baseball and softball batting practice. BattingCagesrUs.com is a division of Nedco Sports, the Hit2win company, a fully licensed sporting goods company established in 1999. Shop securely online or order by phone. Our customer service departments will be glad to answer any questions you might have. We can also provide you with quotes on custom nets. 1-877-431-4487, 8:00 to 5:00 CST. Call Trey or Bill today, they will be glad to answer any questions that you might have. Have a great day! ORDER NOW and RECEIVE 2 BONUS GIFTS! 10' x 10' Impact Panel for net protection. "L-screen" - screen for pitcher protection during batting practice. Over $250 of free gifts! WE EVEN PAY THE SHIPPING ON YOUR GIFTS! YOUR 2 FREE BONUS GIFTS! The MSRP of this package is over $1800. Add shipping and this package could cost over $2,000.00 fom another dealer! "No Tools are Required During Assembly"
enormous benefits at an ecomomy price. via UPS Ground in 7 boxes. and frame. Now That's a Deal! "I really love the cage I bought from you. I saved money and got exactly what my son needed. He has become a much better hitter. His coach has brought his team to our house several times to practice also!" "We purchased our cage last spring. I am a very satisfied customer. My husband, myself, and my son and daughter spend many hours in our cage. My kids have really improved as a result of the batting practice they get!"